HP LaserJet printer error codes, Laser Jet numerical error codes and Laser-Jet printer hardware failures with lights blinking simultaneously! Black & white LaserJet, Color Laser Jet and Laser-Jet Multi-function printer service error code repairs in Southern California! Every HP printer that stops responding to a print job from the computer and the LaserJet printer, Color LaserJet and Laser-Jet MFP fails with an error message or starts blinking error lights simultaneously which means the laser jet printer has failed. HP LaserJet service Manuel�s help us troubleshoot and repair every HP LaserJet printer back to ready state to start printing again. We provide printer error code repairs on LaserJet printer service error code in Los Angeles, Orange County and San Bernardino. We specialize on Laser-Jet printer error code repairs in Southern California. Our technicians have the knowledge and technical ability to provide HP printer repair with error code failures on the first visit. We have ample parts in stock to repair all HP LaserJet printer related to 13 paper jam error codes with 13.1, 13.2, 13.3, 13.10, 13.11, and 13.12 as well as 13.20, 13.21 and 41.3 wrong size paper and 41.5 errors. We also stock LaserJet printer parts failing with 50 fuser error 50.1, 50.2, 50.3, 50.4 errors. We provide Laser-Jet printer repair with error 51.1/51.2 beam detect error as well as error 52.1 and 52.2 scanner error. If your LaserJet printer is failing with error 60.02, 60.3 and 60.4 error we have the lifter motor assembly to repair your printer quickly. We repair HP Design Jet 500/800, 1050c/1055cm, T100/T1120/T610, T770/T790, Z3200/Z5200, Z6100/Z6200 plotter numerical error code 11:11 trailing cable, 81:01 error, 79:04 error, 21:10 service station error and 86:01 broken belt error and check print head paper path error due to a worn out belt.We also repair print defect errors due to bad print heads. Our HP printer repair team of experts will service your Design-Jet plotter and LaserJet printer failing with service error codes and error messages quickly and efficiently. Call us at 800 815-2737 to schedule same-day onsite service appointments. HP LaserJet printer, Color LaserJet and LaserJet MFP repair with common error code failures! 10.00.00, 10.00.01, 10.00.02, 10.00.03 supply memory error is related to defective memory chip on the toner cartridge or third party or non HP toner cartridge . 13.01.00 a page is jammed in the paper path at the tray 1 feed area. 13.03.00 a page is jammed in the paper path at the tray 1 feed area. 13.05.00 a page is jammed in the paper path at the fuser area . 13.06.00 a page is jammed in the paper path at the fuser area. 13.09.00 a page is jammed in the paper path at the face-down bin. 13.0A.00 a page is jammed in the paper path at the face-down bin. 13.10.00 a page is jammed in the paper path at the reversing area. Error 14 - No EP Cartridge detected. Either a bad toner cartridge or h/v power supply. Error 41.3 Tray number 2, 3, 4 or 5 is loaded with media that is longer or shorter in the feed direction than the size that is configured for the tray. 41.5 Tray number 2, 3 or 4 is loaded with a media type (transparencies, envelopes) that is different from what the tray is configured to use. Error 49.4c06 and 49.4c02 is a Critical firmware error occurred. Update the firmware to the latest version. Fuser error code 50.1 Low fuser temperature is an error related to fuser Assembly. 79.4c02, 79.4c06 critical hardware error occurred. 80.01.80, 80.01.81, 80.01.82, 80.01.83 EIO accessory card encountered a critical error. 80 An embedded Jet direct error occurred. 81 A temporary error occurred while testing the printer. 99 A firmware flash-failure occurred. Resend the flash upgrade. Replace the flash DIMM. Most common HP LaserJet Printer service error codes we repair! LaserJet printer failures with ALL service error codes! HP LaserJet printer 13.1 PAPER JAM OR 13.2 paper jam or Paper delay jam at paper feed area. LaserJet printer paper jam or delay jam at Fuser (13.05) or Paper stopped jam at Fuser (13.06). Laser-Jet 4000, 4050, 4100, 5000 and 5100 13.10 paper jam at paper reversing area, or Paper jam at Duplexer. 13.20 paper jam or OR 13.21 paper stopped jam in the paper path, or Paper delay jam at top. LaserJet 4000,4050,4100, 5000 and 5100 41.3 UNEXPECTED PAPER SIZE the paper size sent to print is not the same as the settings for the tray. Laser Jet printer failing with 41.5 media feed error paper reached a sensor too early. LaserJet printer error 50 related failures with 50.1 is Low Fuser temperature 50.2 is Fuser warm up service 50.3 is High Fuser temperature 50.4 is Low/Bad line voltage (Printer hooked up to UPS) 50.5 is Inconsistent Fuser. We repair/service Laser Jet printer 52 with incorrect scanner speed error 52.1 is Scanner startup error and 52.2 is Scanner rotation error. We are best at HP LaserJet error code repairs in Southern California! HP Laser Jet printer service error code repairs and reset maintenance kit error codes! HP LaserJet Printer Maintenance - Clearing the HP printer maintenance count and service error messages! We replace LaserJet maintenance kits and Color Laser-Jet fuser kits and reset the maintenance kit error messages! trained technicians to replace HP LaserJet maintenance kits! Our technicians carry high demand LaserJet maint kits for HP Color LaserJet printer, Laser-Jet Fax and Laser Jet MFP. Most newer HP LaserJet printer needs HP maintenance kits replaced at every 200,000 to 350,000 pages to avoid print defects/paper jams. Most HP Laser Jet printer failures can be fixed by replacing maintenance kits, fuser units, transfer kits and drum kits. Printer failures with image defects, paper jam, wrinkled copies and grinding noise can be fixed by replacing Maintenance Kits. 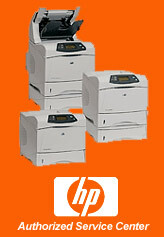 HP LaserJet maintenance Kits in stock to provide HP printer service in Los Angeles, Orange County & San Bernardino! Same-day on-site HP LaserJet Printer service error code repairs in L.A and OC! Providing fast onsite service on HP Color Laser Jet, Laser-Jet MFP and LaserJet printer error codes repairs with 13 paper jam error, 13.A paper jam, 13.1 paper pickup jam, 13.2 paper jam, 13.3 paper jam, 13.4 paper jam, 13.5 Paper jam in the fuser, 13.6 Paper jam in the fuser, 13.20 jam in the paper feed drive, 13.10 duplex paper jam, 13.14 paper jam, Fuser paper jam error, Paper jam in the tray and Paper jam at the exit. We specialize on HP LaserJet 4200, 4300, 4250, 4350, P4014, P4015 and P4515 printer error code 49 4C06, error 49 4C02, error 49 0000ff error, Error 49, service error codes 50, 50.1, 50.2, 50.3, 50.4, 50.5, 50.6, 50.7, 50.99 fuser or P/S failure (HP 8100), 50.1 bad low voltage power supply (HP 8100/8150), 50.9 fuser error, 51 beam detect error, error 52 scanner failure, 57.6 fan error (CLJ 9500/9550), 57.7 fan error (HP CLJ 9500/9550), 59.9 Transfer Belt Error, 59.40 fuser error, 12 printer open, 14 No toner cartridge, 16 toner low, 30.1.19 flat bed scanner error. We repair HP laserJet 2400/2420/2430, P3005/P3015, 4000/4050, 4100, 4200, 4300, 4250/350, P4014/P4015/P4515, 5Si/8000, 8100/8150, 9000/9050 laser printers. We repair HP Color Laser Jet 3600/3800, 4600/4650, 4700. All rights Reserved Laser Printer Services ©1991-2017 - Laser Printer Services Logo, this website and its contents, are property of Laser Printer Services.